Specializing in Variable Refrigerant Flow (VRF) systems, Air Blue Heating and Cooling Inc. provides an energy efficient means to more effectively and precisely maintain the temperature within your commercial facility in Chicagoland and the surrounding suburbs. If your space is too limited to accommodate a standard VRF system, if zones within the building require differing temperatures, or cooling and heating demands vary throughout the day, we provide an optimum solution. Answering the challenge of internal and external impact, Air Blue Heating and Cooling Inc. handles the need for simultaneous heating and cooling to maintain more constant and comfortable temperatures. Through a properly designed and installed VRF system, excess heat from areas that rely on cooling is redistributed to those that require heating, maximizing energy efficiency while trimming costs. As a Carrier Factory Authorized Dealer, the team from Air Blue Heating and Cooling Inc. is trained to customize recommendations and complete accurate implementation. The Carrier Single-Phase VRF is versatile, cost-effective to install, and simple to operate. The varying flow of refrigerant to indoor units meets the exact demand of specific zones, ensuring tighter temperature control and extremely high efficiency. With over thirty years in the HVAC industry, Air Blue Heating and Cooling Inc. puts our expertise and knowledge to work for our commercial customers across Elk Grove Village, Bedford Park, Addison, Elmhurst, and Bensenville, IL. Integrates a Single-phase with a three-phase heat pump and heat recover to create a VRF system without additional controls. 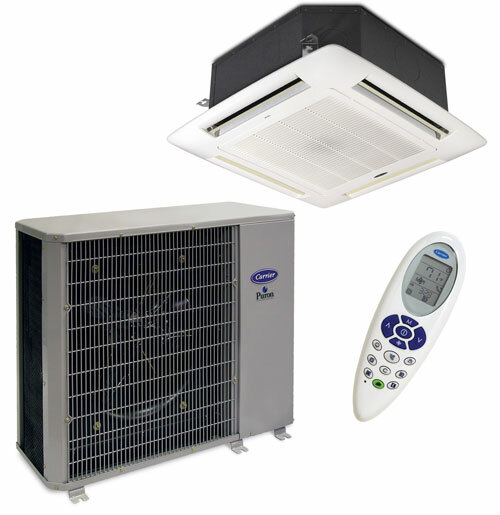 Single-phase VRF system outdoor units are offered in three capacities. All indoor units can be managed by individual controllers or connected to a central control. Rotary technology results in superior balance and lower compressor vibrations. The DC condenser fan motor rapidly matches with changing compressor capacity at operating condition, enhancing part load efficiency. Aerodynamically designed condenser fan and air deflector increase airflow over the coil and minimizes noise. Outdoor unit is piped to indoor units using branch (Y) piping.